I have so many things to write about but this has to come first! I was running some errands yesterday and stopped by the regular charity shop. I was doing quick rounds around the place and then I saw it! Just waiting there on top of a shelf of cooking utensils (just goes to show that you need to look everywhere...). Isn't it amazing? I've been wanting one of these for a while and there it was, just waiting for me. Carrying it around made it awkward to look for other things, but I didn't care. I was practically hugging it the whole time. It's a French globe from around 1977 or 1978, it has a slight texture to it too, you know, where the mountains are. So amazing! I'm just squeeling with happiness right now. The fun didn't stop at finding and paying (wait for it) $5, but it continued as I got home and wanted to figure out how old it is. I figured the best (and the most fun) way to do it, is by looking at the names of the countries. So, first I looked at the most obvious place with somewhat recent changes, Europe. I could see Czechoslovakia and U.S.S.R, not to mention East and West Germany. So, clearly it's from before 1990. Ok, then what? Rhodesia is still there. It became Zimbabwe in 1980. So, we're going into the 1970s. Ok, seems like we have only one Vietnam, North and South Vietnam united in 1976. We also have Djibouti, it was known as French Somaliland until 1977. The photo on the right was actually what answered it for me. (Well, not the photo, but the part of the globe that's shown in the photo) My globe shows Ellice Islands, which became Tuvalu in 1978. It was fun to figure it out (also, it has become apparent to anyone reading this how much of a history nerd I really am). What do you think? 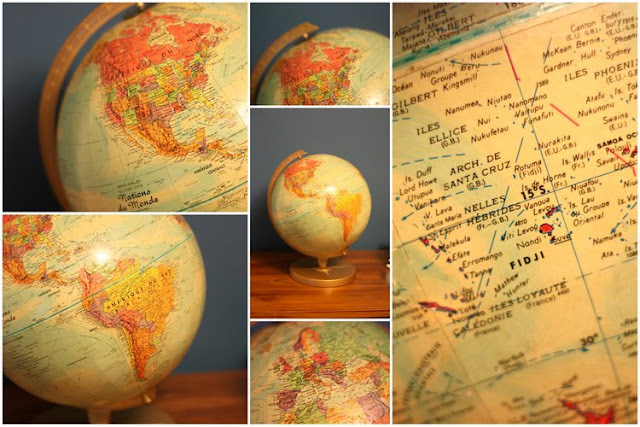 Yay or nay for the globe? That's so awesome Ö_Ö~ old maps and globes rock! Totally agree. I'm still so excited about finding it and giggle a bit when i see it. Like it a lot. Especially the political-geography forensics. That was almost the best part. The actual best part was that, you know, I now have a really cool globe. I'm tempted to put together some type of an installation... We'll see what I come up with.